I don’t buy ANYTHING at Harbor Freight. To my knowledge it is an outlet for Chinese Junk. Why would a citizen of the United States and a gun owner willing buy a Chinese product??? I realize that often one has no choice but in this case there are alternatives. Tom, I couldn`t agree more with you. I agree with not buying chinese, that is why U.S. manufacturers need to take a good hard look at the overinflated prices they are charging. For whatever type of cart you may choose to use, I’ve found that the replacement rubber or urethane hull or keel rollers for boat trailers are relative inexpensive barrel and/or stock supports. Attach however your application allows, and add a bungie cord to keep rifle in place. The computer you’re using has more parts made in china than this cart does. If you’re that anti-chinese, what will you wear on your feet? Also, you should get your hands on a Norinco M305. One tough piece of kit for a third the price of a Springfield M1A. There are some incredibly good tough tools that come from China too. Yeah, I’d like to see that stuff made here, but the Chinese stuff is in many cases good enough for me at a price i can afford. I recognized in my previous message that one doesn’t always have much choice when buying products but we have bought on price alone in many cases and now we have fewer jobs and fewer choices. Furthermore, companies are finding out that labor in China is becoming less cheap and the lack of regard for patents and copyrights is a big problem. More companies are moving production back to the United States. Norinco, to my knowledge, is a branch/susidiary of the Red Army. I’d leave out the wood block for tilting the cart back. As it is, the cart will easily tip over backwards if you have lots of stuff in the box on the back and little or nothing in the tank holding area. It’s annoying to be unloading the cart and have it tip over on you. EDITOR: Two half-gallon water bottles held in the tank holding area will fix that. But you raise a good point if the cart’s only used to carry one gun. 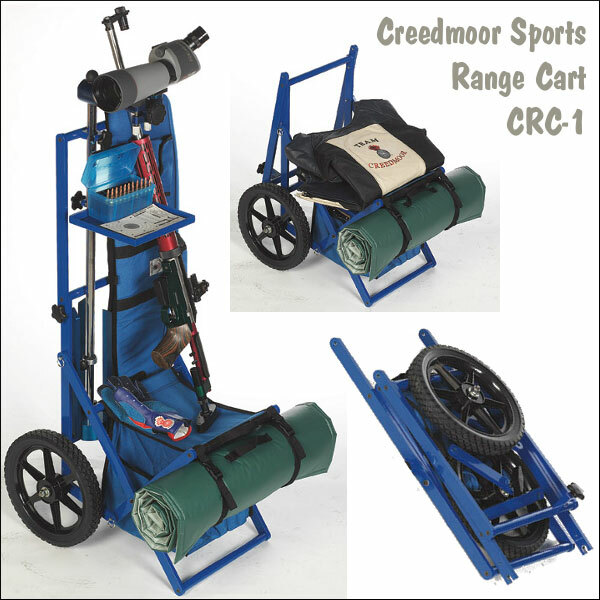 We’ve made a cart like this that holds three rifles (and a large tripod, folded) and there is always at least one rifle sitting in the main section. Wake up and smell the turnips. Even Craftsman tools are made in China today.. You can thank our Government for all the stuff made in China, they made it all possible..
Yeah, Harbor freight sells some junk. But they have a lot of things that fit the home DIYer that has to stay within a budget.. their Pittsburgh Tool line comes with a lifetime warranty equal to Craftsman or Snap-on tools at a lower price tag.. and as I already said. Even Craftsman is made in China today.. The end of the first paragraph states to “fill your tires before heading to range”. I use hard rubber tires as I’ve heard several air filled tires blow at the range, even Camp Perry. Also, dont have to worry about getting a flat. How much does this welding cart weigh? 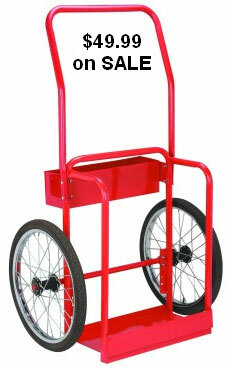 Does anyone make a similar cart out of lighter material like aluminum? I have given a lot of thought to designing my own ideal rough terrain walker/ tool carrier/ gun and shooting/hunting gear carrier before my bad left knee forces me to do something drastic to get around. I’m 79 years old but I still love to hunt and to do yard work and field work on our property and take care of our 2 horses and our last surviving sheep [who has crippling arthritis much worse than I do.] 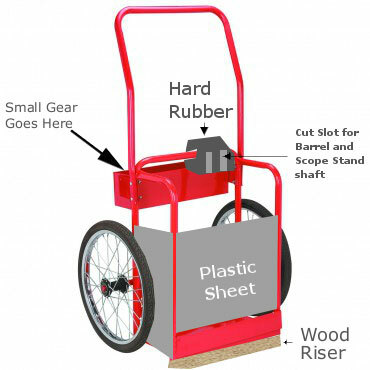 It looks to me like the welding cart configuration would be ideal starting platform for transporting rifles/ shotguns and shooting or hunting gear or fieldwork tools like shovels, rakes,scythes, tamping bars, saws or small hand tools and hardware. Plus [and this is important for me, at least], it doesn’t look like an old man’s or an old ladies walker that you buy at a drugstore. But to make it really useful for me, it would have to have a rear wheel or pair of rear wheels so that it could be tipped back for moving or resting without tipping over backwards completely. Also, if the geometry and the weight distribution were correct, an operator like me could put enough of his weight on the [extended] handles to take enough of the load off of me bad left leg and still have mobility. Has anybody seen anything at all like I have been describing? As I said I have given this a lot of thought since I have noticed that even on my worst bad leg days, I can lean on my push power mower for hours, trimming around trees, bushes, flowers and buildings without feeling any pain or risking a trip or a fall. Incidentally, my 91 year old father-in-law was pushing one of those lightweight drug store walkers in his back yard when he reached down to pick up a piece of trash and he and the walker tipped over. He broke his neck, suffered a cerebral hemorrhage almost immediately and never came out of the coma before the wires and tubes were pulled a few days later. He was a big man and that lightweight, attractive drug store walker was A DANGEROUS piece of equipment for him, as I imagine it is for many other elderly people. I realize this thread is old but I must comment. The first person who posted bashed Harbor Freight saying they would never buy anything from them. I used to feel that way until my mind was changed by the products they carry. I believed the rumors that their products were junk. 1) Harbor Freight actually carries brand name products, many of which are made in the USA. Don’t believe me? Just browse their aisles. 2) Some of their products are low quality but some are of exceptional quality. For example, the rolling tool chest I have is of far better quality than the commercial grade Craftsman chests I have. Check out videos on Youtube. One man who was a machinist, if I remember correctly, and who has a SERIOUS shop with an incredible number of extremely high quality tools and machines has purchased a HB tool chest to go along with his big Snap-On chests and he concludes that the HB chests compare favorably with the extremely high-priced Snap-On chests. 2) I was hesitant to buy HB hand tools at first but I’ve come to learn from my experience that they are at least as good and even better than my Craftsman tools. And the HB tools under the Pittsburg name have a lifetime warranty too. Just pick one up! You’ll feel the weight and quality immediately. When I buy something from HF, I just check out the reviews on their site first and inspect the items first. Anyone claiming that they only sell junk or that they only sell cheap Chinese products simply hasn’t actually been to a HF store. I suspect that those who bash HF simply haven’t ever been to a HF store or actually checked out their products. I like to buy products made in the USA too but HF does sell USA made products and some of their stuff made in China matches the quality of anything made in the USA for a MUCH lower price. Check it out before you bash HF. Well Tom, lots of people will pay 49.99 for a well made welding cart over a creedmoor cart, because 499 is way too much for what the creedmoor cart is. There’s probably 30 bucks worth of materials in the Creedmoor cart. I work way too hard for my money to squander it.